“There are two types of players in this game,” said Mets manager Terry Collins last year. “Ones who have been humbled and ones who will be. And if you’ve never been humbled, you don’t know how to get through it.” After a promising rookie season in 2015, Mets outfielder Michael Conforto was humbled in 2016 and after being dismissed by many in spring training, the 24-year old Seattle native has rebounded to being the Mets lone representative with baseball’s best at the All-Star Game in Miami on July 11. After batting .270 in 2015 plus leading the Mets with a .333 average and homering twice in the World Series, 2016 started as a continuation of his charmed rookie season. Conforto ended April with a .365 average but when the calendar turned to May, he slumped and never recovered. Batting .174 over the final five months of the season, he lost his starting job and was demoted to the minors. What happened? 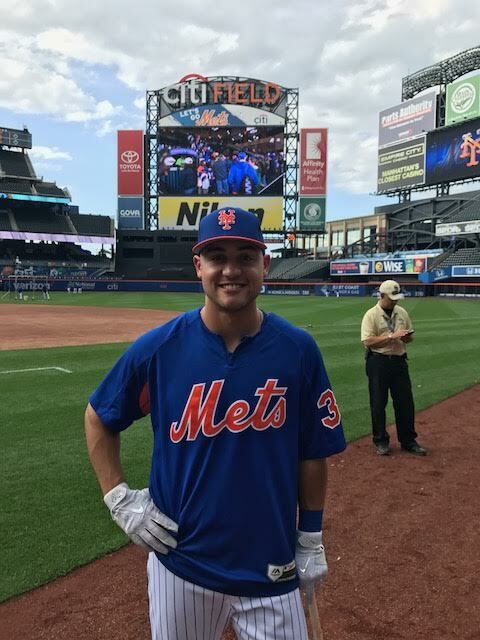 “I got away from my strengths – using the whole field,” Conforto told me as we chatted in front of the Mets dugout during batting practice on July 15 at Citi Field prior to the Mets 9-3 victory over the Colorado Rockies. He admitted that his confidence failed him as his numbers went down. When you’ve only known success Conforto said, “It’s easy to assume you’ll always be successful.” But his failure in 2016 was a lesson in maturity for which he is grateful. “This is a long season and you can’t carry the baggage of a slump with you.” He learned not to let a slump “get to you,” to keep “an even keel,” and taking it one at bat at a time, good or bad. After singling in his first at bat, I asked him what it was like to come up in the ninth inning with a chance to win the game with a second base hit. “It was an incredible experience to be in that position,” with the game on the line. “I was ready to win the game,” he smiled but unfortunately for Conforto, pitcher Craig Kimbrel struck him out on a 2-2 pitch before the AL topped the NL 2-1 in 10 innings. 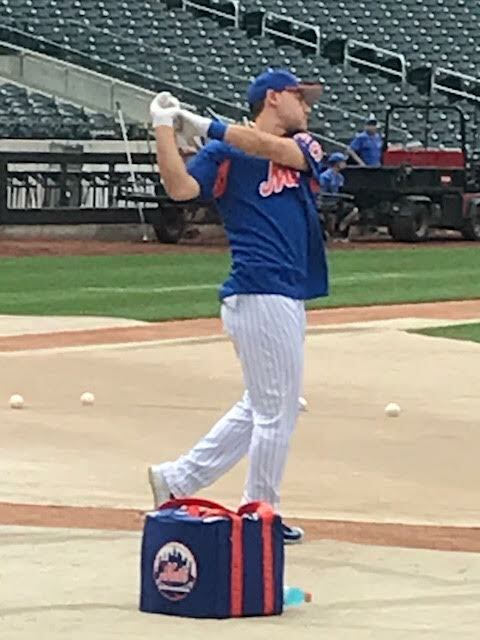 Although I wasn’t able to interview Conforto during his much-anticipated debut two years ago, I joked that I managed to interview his father, who was at Citi Field that first weekend. Recalling that his father played linebacker at Penn State and his mother was an Olympic gold medalist in synchronized swimming, I asked how that impacted his athletic endeavors; Conforto said his parents knew what to look for in coaches. Specifically, they sought out coaches for him that had “discipline” and “wouldn’t accept less than the best” from him. Looking back, he said having “intense” coaches was beneficial to him. Two years after fans of the Mets were practically begging the front office to promote Conforto to the major leagues, a similar plea is being made for 2017 “phenoms” Amed Rosario and Dominic Smith. Does he have any advice for Rosario and Smith? With his .282 batting average, .400 OBP and 16 home runs, Conforto has been one of the few pleasant surprises for the disappointing Mets in 2017. With his example at how he turned failure in 2016 into success in 2017, perhaps he won’t be the only Met at the All-Star game next year. I invite you to follow me at faninthebox.com.